Info "Smash the moles with both your hammers! Yeah! Smash! Get 'em!" Vermin is a microgame found in the Anything Goes folder in WarioWare, Inc.: Mega Microgame$!. 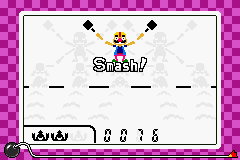 The game is a parody of the Game & Watch classic of the same name. The objective of the game is to help Wario stop the incoming moles from digging up his garden by smacking them all with the hammers. 1st level difficulty: One mole. 2nd level difficulty: Two moles. 3rd level difficulty: Three moles. This page was last edited on February 1, 2018, at 04:19.